As an authorized inspection station, we are licensed to do a Maryland State Inspection on your vehicle and certified to complete all repairs needed to pass the safety inspection. Cars, SUVs, Light Trucks, Trailers! Most used vehicles are required to have a safety inspection prior to sale or transfer. The inspection certificate is then submitted to the MVA in order to register the vehicle. The inspection itself is a 26-point exam measuring the safety of the steering, suspension, brakes, wheels/tires, exhaust system, fuel system, electrical lights and the chassis. If any of these items fail the inspection, you have 30 days or 1,000 miles, (which ever comes first); to complete the required repairs before the vehicle must be inspected again. Once the car passes inspection, we will issue you a certificate that must be presented to the MVA for registration within 90 days. A Maryland State Police trooper or other law enforcement officer may issue a Safety Equipment Repair Order (SERO) to the operator of a vehicle that is observed to be defective or not functioning in accordance with Maryland laws and regulations. The SERO requires the vehicle owner to have the problems cited on the SERO repaired within 10 days, and a certification of the repair to be submitted to the Maryland State Police (MSP) Automotive Safety Enforcement Division (ASED) within 30 days. If a Safety Equipment Repair Order is issued for your vehicle, you must have the vehicle repaired within ten (10) days. After the vehicle is repaired, you will need to have the repair inspected and certified. Our registered inspection mechanic will sign and stamp all copies of the SERO to certify that all defects cited on the SERO have been fixed correctly. The copy must be submitted no later than 30 days after the date on which the SERO was issued. Our shop is centrally located in Harford County Maryland and provides vehicle inspection services to Aberdeen, APG, Havre de Grace and surrounding areas. Most used vehicles are required by Maryland Law to undergo a safety inspection prior to its sale or transfer. Generally, the seller or transferor of the vehicle is required to obtain the inspection certificate. if your vehicle is inspected at an inspection station that offers an electronic inspection service (e-inspection), you will not receive an inspection certificate. Your inspection certificate will be electronically sent to the MVA. To obtain an inspection certificate, you must have your vehicle inspected at an authorized safety inspection station in Maryland. T&D Automotive is one of the facilities licensed by the Maryland State Police that can provide an inspection for your type of vehicle. If the vehicle meets all safety standards, the registered inspection mechanic will prepare and give you two copies of the Maryland Inspection Certificate, or electronically transmit the e-inspection to the MVA. 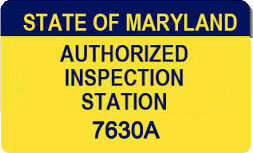 If your vehicle fails to meet even one safety standard, the Maryland Inspection Certificate cannot be issued. You must have the problem(s) identified on the station's inspection report fixed and then have the vehicle re-inspected by the same registered inspection mechanic at the same station. © T&D Automotive, Inc. • Website by Prize WebWorks, Inc.